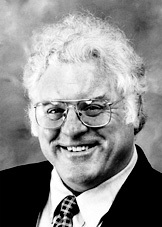 Robert Laughlin entered the University of California at Berkeley as an electrical engineer major in 1968. Laughlin credits Berkeley as “a special place in American physics,”since many great physicists spent time there. The physics faculty inspired him to switch from engineering to physics, to the horror of his parents. The call to serve during the Vietnam war hampered Laughlin's academic progress. With an undergraduate degree in mathematics, he joined the military, serving in Germany after completing missile school. After that two–year hiatus from academic life, Laughlin entered graduate school at MIT in 1974 to work on solid state physics. Bell Labs was the next step after graduate school, where Laughlin met semiconductor experts and began to “understand what amazing materials they were and what they could do.” The next stop was Lawrence Livermore Lab, where he worked with the group responsible for generating equotion–of–state and opacity tables for use in design codes. This era was when Laughlin wrote the paper for which he received a Nobel Prize in 1998, along with Horst Störmer and Daniel Tsui “for their discovery of a new form of quantum fluid with fractionaly charged excitations.” Laughlin researches and teaches at Stanford University. See more about Robert Laughlin's Nobel Prize here.